Many folks will tell me how they admire my minimalism….but they could never do it with kids/spouse/pets or think about giving up their books/Pez collection/baseball cards. “OK,” I say. Every game has its rules. Draw a big Sharpie circle around whatever it is you can not do without and think about minimalism outside that circle. Here is my dining room. This is the room my family of four eats in 2-3 times per day. It also gets used an “office” or project room, a place to read and sometimes a place to fold laundry. All of the rooms in my house multi-task. This is normal in many traditional homes around the world. I’m not sure when middle class folks started to designate rooms to furniture types instead of function, but I would guess that it happened about the time marketing took off after WWII. 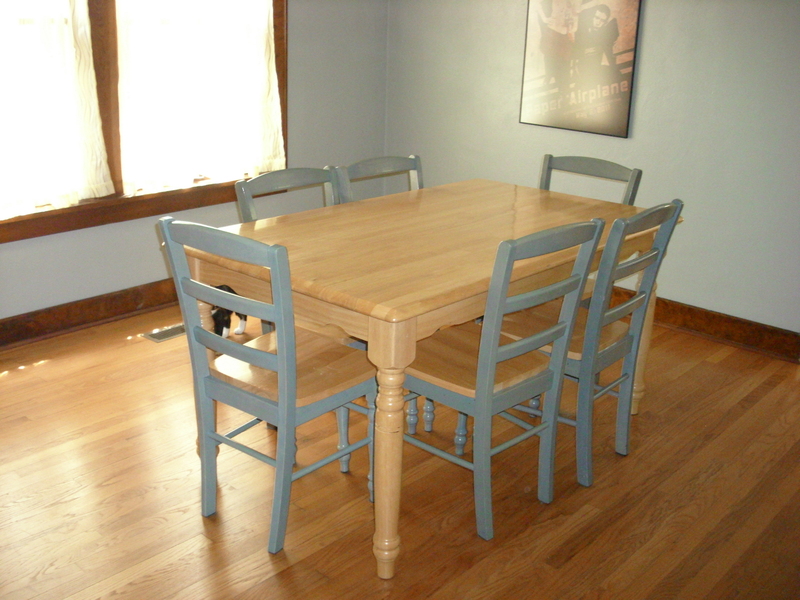 Also in the room are the über functional table and chairs. And because every environment needs a little soul, there are three works of art. 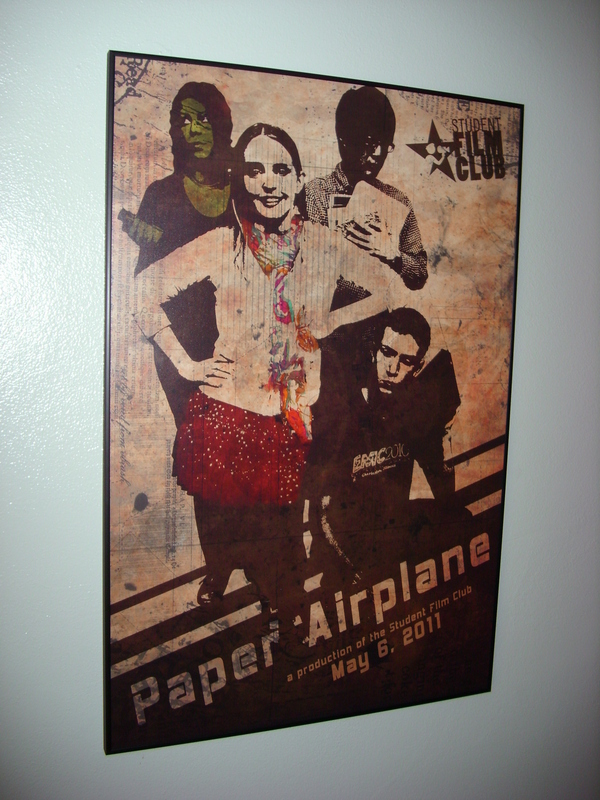 The first is a movie poster for a movie two of my kids help make. That is beloved daughter in the upper left corner and beloved middle son in the lower right. The movie was a hoot. Here is a trailer for it. 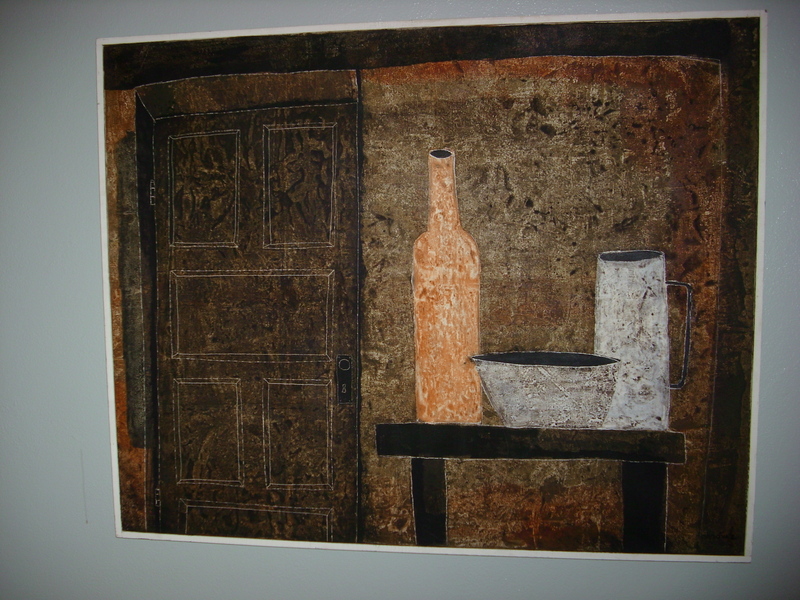 Here is a painting that my mother carted back from Mexico City at significant risk to our personal safety. Mom and I both think the painting says, “Welcome.” Other family members were too traumatized to see it in a positive light. 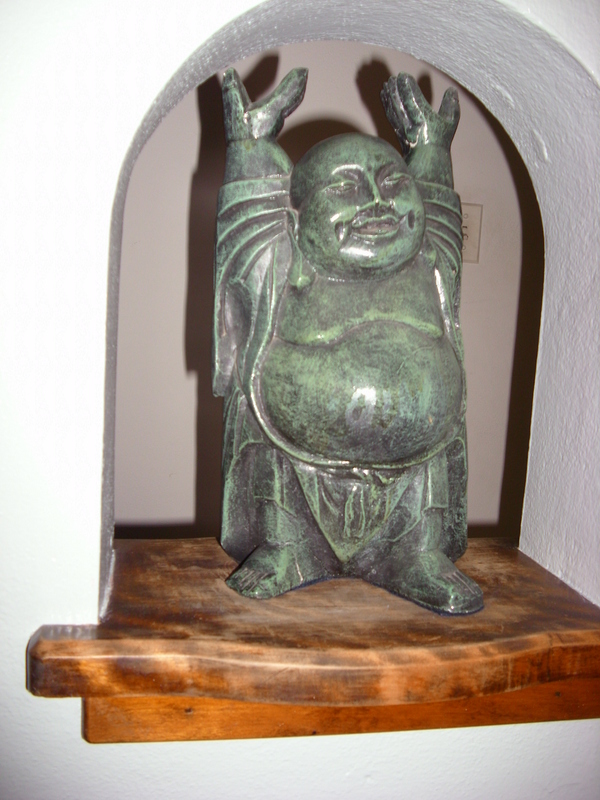 And my artistic favorite-The Joyful Buddha, an housewarming gift from mom. 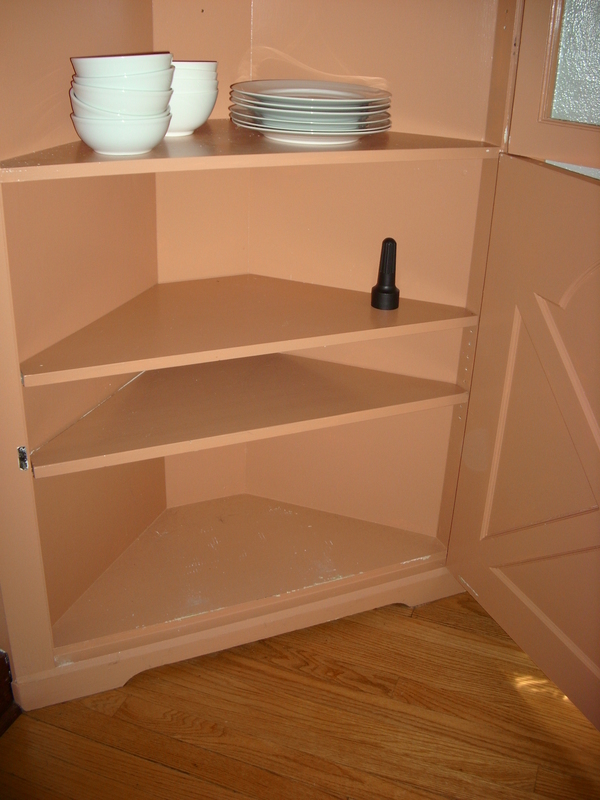 There is also a portion of the dish hutch with a solid door. The only thing in there is the tool to unscrew the bulbs from the light fixture. So there you have it. 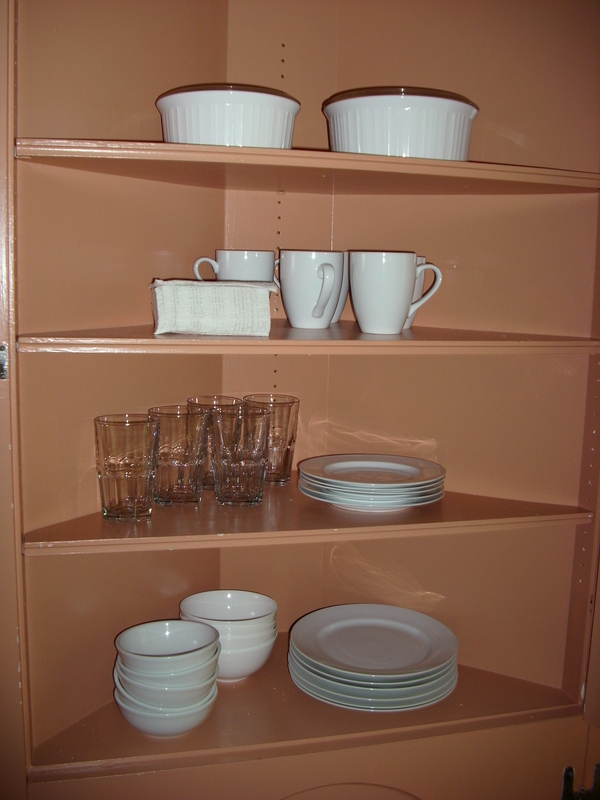 One of the most used rooms in the house–42 items total. I can hear that clock ticking. Not the one in the crocodile that the Lost Boys are afraid of. As a child, I could not wait to grow up, could never understand why someone would want to remain in an infantile state forever. No, the clock I hear is the one to my freedom. My daughter is a senior in high school. One more year and she is out of the house. My middle son is a junior. Two more years and he has moved on. Youngest is in 8th grade. He has 5 more years of schooling here left. But I can hear that clock ticking. And it manifests itself in two opposing ways: I want to squeeze the joy and intimacy of every single moment that I have, because I know it will not likely be like this again. And I relish my new freedom. One less child in the house is less driving and co-ordination of schedules. It is one less person’s tastes I have to accommodate when planning the meals. It is less mail, less shopping, not as many trips to the instrument repair shop. I am getting a tiny glimpse of it this week while the kids are in DC with their dad. No cooking. No trips across town to a music lesson. It is very peaceful. Will it get boring? Hmmmm. I do not allow kids boredom, the world is filled with fascinating things to do/read/places to go. So, I think not. Degree of freedom this week: 3/10. In a year? I’ll let you know.